Leather furniture looks nice in your home, and your cat may think that it’s the perfect thing to turn into his or her new scratching post. This can quickly ruin your leather furniture, and you should be able to have nice things while keeping your cat happy at the same time. But, how to stop cats from scratching leather furniture? We’re going to tell you why cats scratch, several possible ways to address it, what not to do, and more in the following post. Boredom – If you don’t have enough toys or things for your cat to do, they can get bored. This boredom can easily and quickly turn into destructive behaviors like chewing or scratching surfaces that they’re not supposed to touch. Enhance Mood – Did you know that the act of scratching furniture or items simply feels good to your cat? It can minimize their stress levels, improve their mood, and it also decreases the chances in them behaving in other unwanted behaviors. Maintain Claw Health – In order for your cat to keep their nails healthy and strong, they have to periodically get the outside nail husk to fall off. One easy way for them to accomplish this is by scratching because the husk gets stuck in the fabric and pulls away from the nail. Marking Their Territory – Your cat has scent glands in their paws, and it releases a scent each time they scratch something. This is an important way for your cat to mark their territory, and they may feel this urge even if they’re the only cat in the household. Stretching – Most cats like to scratch and stretch when they wake up from a nap. They can hold on to your couch and stretch, and this helps to loosen up their muscles and tendons before they continue on with their normal routine. By nature, cats are very independent and smart animals that can catch on quickly when you try to teach them something. There are several things that you can do to save your leather furniture and entertain your cat at the same time. Leather tends to give and tear easily under your cat’s claws, and this is why they may gravitate toward it over your other furniture or items. Keeping your cat’s nails trimmed to a blunted edge may reduce or stop their scratching habit altogether, and you can either do it on your own, take them to the vet, or have a groomer do it. Even though cats are more independent by nature, they still need mental stimulation to prevent them from engaging in destructive behaviors due to boredom. Play with your cat for longer periods when you’re home with them, and you can also introduce new toys that they can have when they’re alone to prevent boredom. You can buy one or two scratching posts or scratching boards and place them around your home in areas that are away from your leather furniture. It should have a toy of some sort attached to it to entice your cat and encourage them to use it over the course of several days. If you’ve tried everything else and your cat stubbornly returns to your leather couch, consider adding a furniture or couch cover. This will stop your cat from getting any enjoying out of scratching your furniture, and they may start to use their scratching post or other appropriate mediums. You want your cat to associate doing good behaviors like using their scratching post with positive reinforcement. Each time they use an appropriate spot as a scratching post, give them a small reward. Once they learn that they only get a reward for using certain things, they’ll be more encouraged to keep the behavior going. Along with things you can do, there are a few things that you shouldn’t do when you’re trying to train your cat. You want your cat to be healthy and happy, and avoiding the following can help. DON’T: Swat your cat when you see them on your leather couch. This can make your cat afraid of you. DON’T: Push your cat off the furniture. Even if it’s a small drop, they could get hurt. DON’T: Use inconsistent training methods like a squirt bottle. This will encourage your cat to be sneaky and wait until you’re not around to scratch. DON’T: Force your cat to use a scratching board or post. It could injure or scare your cat and make them avoid it altogether. DON’T: Throw away your cat’s torn scratching post. It may look ugly, but your cat may still love to use it, and they may revert back to the couch if it’s gone. Find and buy several scratching posts and interactive toys. 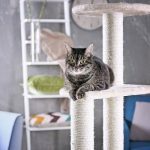 Sisal fabric is a popular choice for scratching post fabric because it’s stronger than sisal rope, but you want to get a few options because you’re not sure what your cat will like. Reward your cat for using them. You want to strategically place your scratching posts, scratching boards, and interactive toys around your home in areas where your cat naturally gravitates to, and this includes in front of the leather couch. Let your cat investigate them, and give them a treat or praise them when they use them throughout the day to start the positive reinforcement process. Now that your cat has a few alternative areas to scratch, you can add a couch cover to make your leather furniture a less attractive option for your cat to scratch. You can tuck your couch cover tightly around the scratched area to block access, and spritzing a light citrus scent will further repel your cat. Now that your cat has had a few days to get used to the scratching posts, it’s time to take steps to attract them to the area. You can spray or rub catnip or honeysuckle on and around the scratching posts because cat’s love this scent. It’ll draw them right to the post. You can get a wand toy or any toy that will interest your cat and drag it around and over the scratching posts. Not only will this exercise help to tire your cat out, but it’ll also help them start associating good things and rediscover the scratching posts. By this point, your cat shouldn’t be interested in your couch, and they should be going over to their scratching posts. If not, you can get safe and non-toxic cat deterrent sprays from your veterinarian or local pet store to spray on and around your couch to encourage your cat to stay away. If you plan to get a new couch to replace the old one, you still have to make it unattractive for your cat to go after for a few days. Also, you may want to consider adding new scratching items for your cat to interact with or shifting their existing scratching posts around to keep them interested. Now you know how to stop cats from scratching leather furniture. We told you several reasons why they do it, how you can deter them, a miniature book camp exercise and more that you can use to have a happy cat and pristine leather furniture.